Ubisoft took some time away from annual installments of Assassin's Creed to reinvigorate the series with new ideas, and new ideas it most certainly has found. But I'm not talking about Assassin's Creed Origins' trip back in time to ancient Egypt - I'm talking about Assassin's Creed Rebellion, an upcoming iOS and Android game that looks like Assassin's Creed meets Fallout Shelter in all the best ways. The Ubisoft Blog goes into more detail: "Set in Spain during the height of the Inquisition, Assassin’s Creed Rebellion lets you build out your Brotherhood HQ with new rooms that enable you to train your Assassins and craft new items and equipment. As you level up your Brotherhood, additional rooms and other content become available, opening up new upgrade options." You'll be able to recruit more Assassins to your base by collecting DNA fragments, which sounds very similar to how many of these hero summoning mobile games work. Once you build up your base, you'll be able to send out your Assassins on missions. Each Assassin has unique skills, so you'll want to be tactical about who you send to do what. There are standard missions which will net you resources for upgrading your base and Assassins, Loot missions which earn crafting materials, and even Story missions. I'm not sure what kind of story such a game will tell with such cute widdle Assassins, but it'll have one, dang it. You can check out some gameplay below. 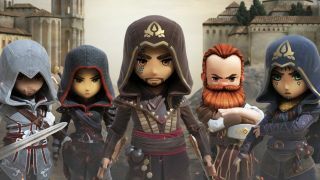 There's no release date set for Assassin's Creed Rebellion, but if it's anything like its namesake sneaky murderers, it'll be here before you know it.